Paving Contractors Doncaster. Natural stone specialists. A Properly installed a paved area will enhance your garden and add value to your home. Paving can be a considerable investment so it should laid by professional paving contractors, as poor foundations and workmanship may cause patios and drives to sink over time.Whether its a small patio, a new driveway or large commercial project our paving contractors deliver the highest standards providing paved surfaces that last with attention to important details such as drainage.MJS lay all types of paving including block paving , Natural stone and concrete pavers. Covering Doncaster and surrounding areas of South Yorkshire our clients benefit from a first class servive which is competitively priced. The image above shows Black limestone paving work at Finningley Doncaster. The image shows the popular black limestone paving when wet, paving sealants can be applied to preserve this look. 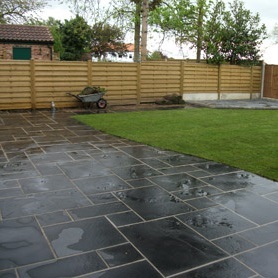 To see black limestone when dry please see our paving projects page.